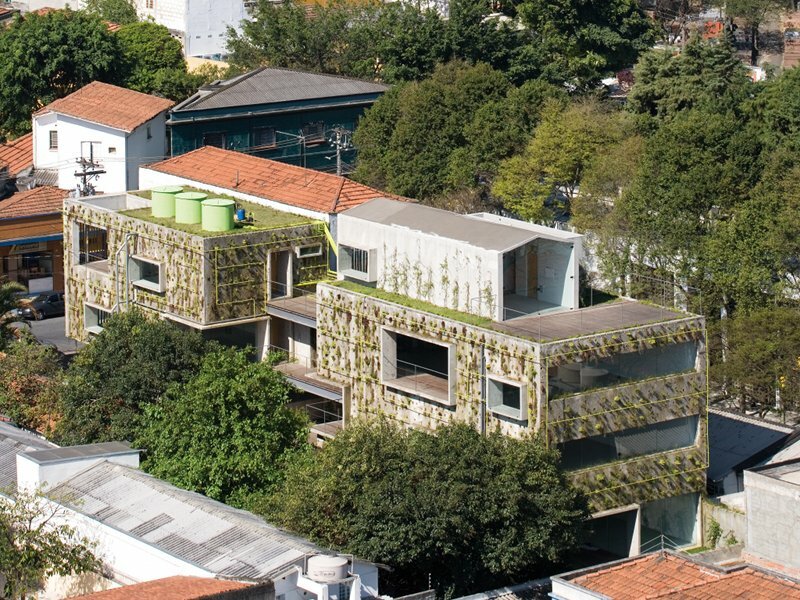 This artists' atelier and office building in São Paulo, Brazil features a facade covered in plants sustained by a network of tubes that provide mist at regular intervals. Designed by Triptyque and dubbed Harmonia 57, the unique office building is set amidst a creative neighborhood on the west side of São Paulo. Two volumes make up the building, which is clad in a porous concrete skin with pockets for plants. A complex water recycling network collects rainwater and grey water for use in irrigation and toilets, while a green roof helps minimize storm water runoff. The office building and artist atelier was completed in 2008 and it recently won the 2010 ‘Built Environment’ award from the Zumtobel Group. The project is composed of two volumes joined by a metal footbridge above an internal plaza. The front volume is raised and rests on pillars, while the back volume is set on a solid foundation and includes a ‘bird-like’ feature on the roof. Large windows, operable shutters and terraces allow daylight to penetrate the interior spaces and lend the building a feeling of lightness. Porous concrete is used for the facade of the building, which is covered in plants set into niches and irrigated by a misting system. Rainwater is collected from the green roof and grey water is recycled to provide water for toilet flushing and irrigation. The network of pipes is integrated into the architecture as an aesthetic feature as well as a functional one — for example, water pipes are used as handrails along staircases. The living wall and green roof act as a buffering skin for the building and serve to insulate the interiors and reduce noise. Plants were chosen based upon both their aesthetics and growing capabilities – some were chosen to provide shade, while others crawl over the surface of the building providing a layer of humidity for other plants. The artists' atelier and office building features a facade covered in plants and wrapped in a network of tubes that provide mist at regular intervals. The unique office building is set amidst a creative neighborhood on the west side of São Paulo. A complex water water network collects rainwater and grey water and recycles it for use as irrigation and toilets, while a green roof helps minimize storm water runoff. A misting system supplied by recycled water irrigates the plants on the facade. Large windows, operable shutters, and terraces provide daylight into the interior spaces and lend the building a feeling of lightness. 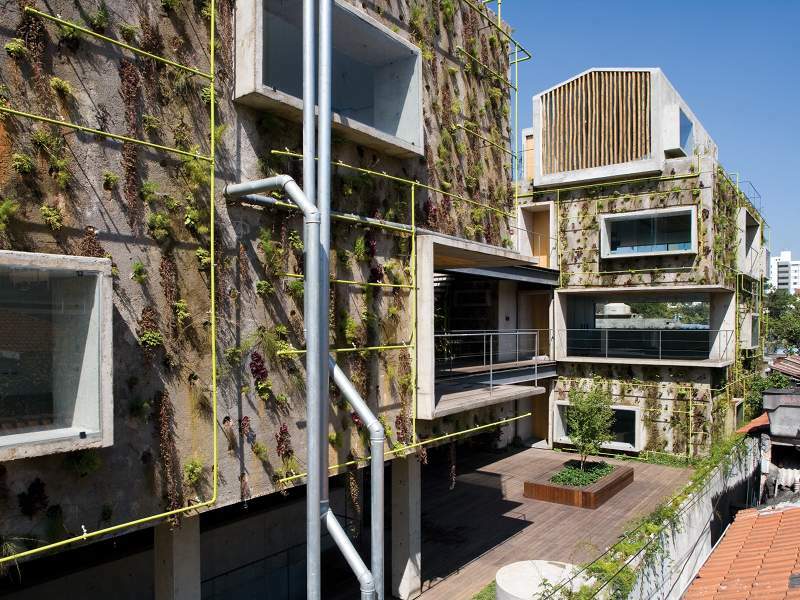 Two volumes make up the building, which is clad in a porous concrete skin with pockets for plants. The office building and artist atelier was completed in 2008 and recently won the 2010 'Built Environment' award from the Zumtobel Group. The front volume is raised and rests on pillars, while the back volume is on a solid foundation and includes a 'bird-like' feature on the roof. 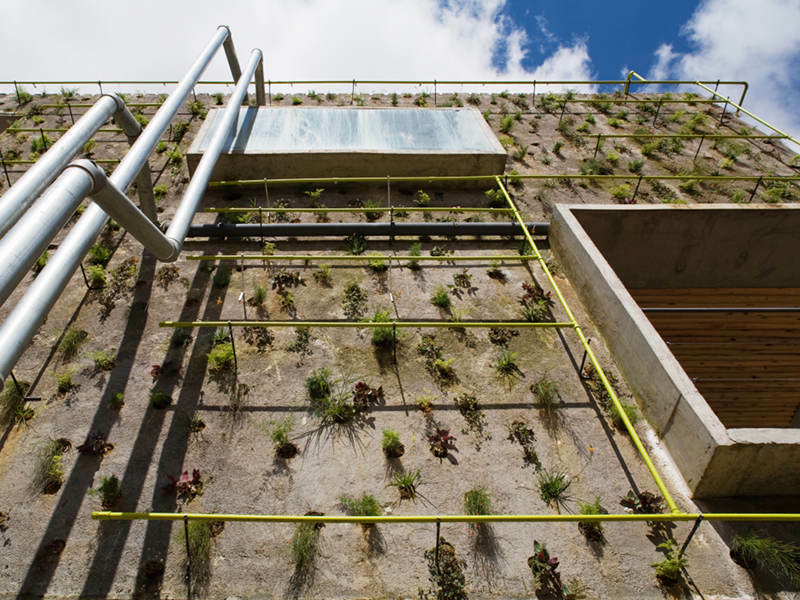 Porous concrete is used for the facade of the building, which is covered in plants set into pore-like niches and irrigated by a misting system. Rainwater is collected from the green roof and grey water is recycled to provide water for toilet flushing and irrigation. The network of pipes is integrated into the architecture as an aesthetic feature as well as a functional one -- for example, water pipes are used as handrails along staircases. The living wall and green roof act as a buffering skin for the building and serve to insulate the interiors and reduce noise. Plants were chosen based upon both their aesthetics and growing capabilities - some were chosen to provide shade, while others crawl over the surface of the building providing a layer of humidity for other plants. This diagram explains the complex network of piping, tubes, water collection, and recycling.